Fred Laberge, a resident of Norfolk and a frequent visitor to Stony Brook, is always looking for the next great shot. 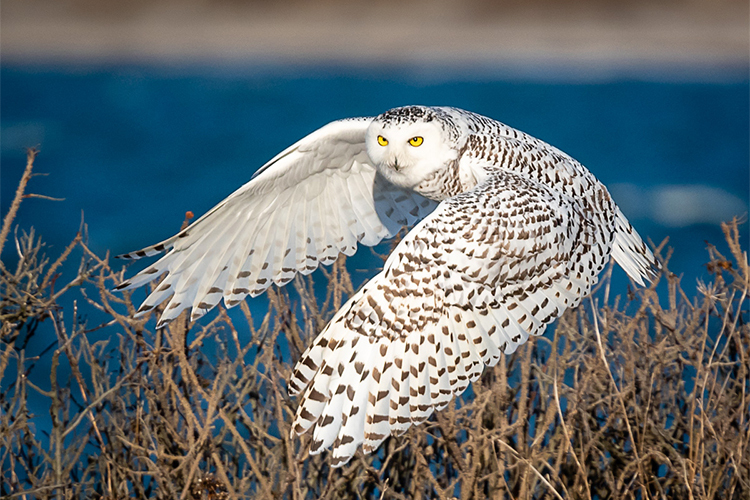 That’s why, on January 4, he set out for Westport with a very specific goal in mind—to capture a spectacular photo of a Snowy Owl. The word among his friends was that one or more snowies had been spotted on Gooseberry Island at Horseneck Beach State Reservation. A review of recent sightings on the e-Bird website confirmed it. 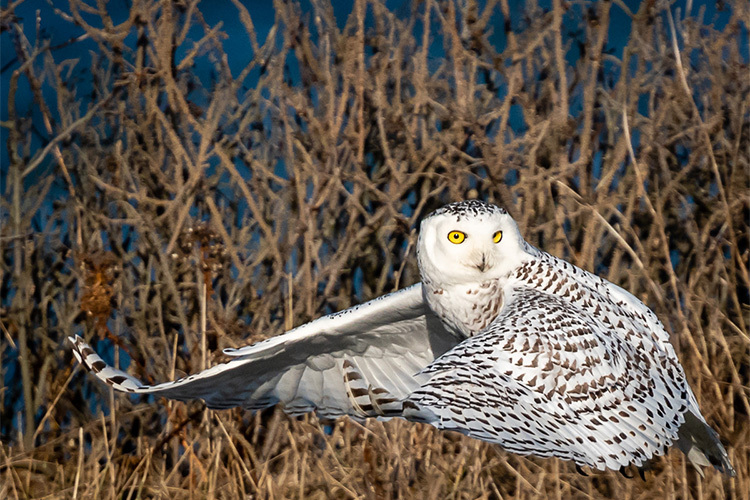 Fred had attempted to catch a glimpse of a Snowy Owl on a previous trip to Westport in December. While he saw many interesting shorebirds, there was not an owl to be had. The trip on January 4 was his second attempt, and luck was on his side that day. 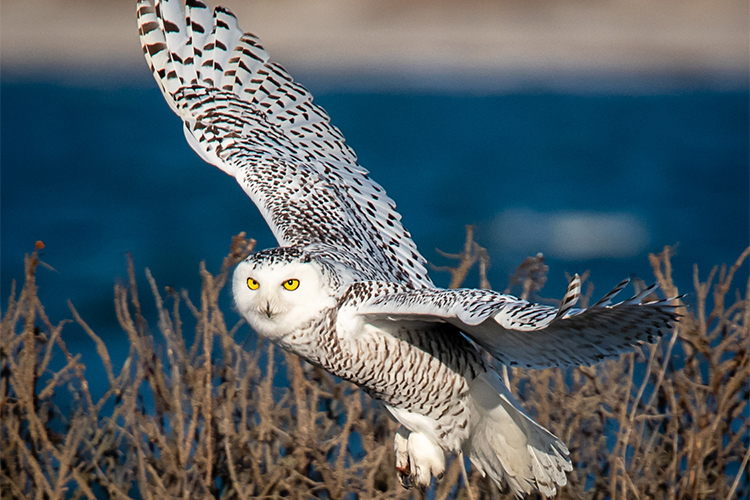 Immediately upon his arrival around 9:00 am, Fred spotted a snowy flying toward him near the parking lot at the end of the causeway. Not wasting a minute, he parked quickly and rolled down his car window with camera in hand. The owl was sitting on a post and did not seemed at all phased by Fred’s presence. He took a few images before the bird flew about 75 feet away to a pothole filled with rainwater. Once it landed, the Snowy Owl continued to sit there drinking water from the puddle. Seeing his chance, Fred slowly (and quietly) exited the car. He worked his way along a sand dune, taking care to stay low, and managed to take a few more images. After 2-3 minutes, another car approached and the owl took off in a westerly direction. As the bird flew diagonally towards him, Fred was ready with his camera. The light was perfect, and he was fortunate to get several stunning shots of this beautiful owl looking right at him. “Right place at the right time for once,” he said. Got a great photo of your own? We love receiving photos from Stony Brook visitors! If Fred’s image and story inspired you to share your own, please send us your photos. We may feature them in our e-newsletter or on this blog! This entry was posted in Your Photos on January 25, 2019 by Don C.
This is such a beautiful shot! !